Hippocampus Neurobiology of Depression CRF BDNF CREB Serotonin Antidepressants Limbic System Major Depressive Disorder Mental Health Mental Illness Gene Therapy Seattle Psychiatrist Ron Sterling M.D. The Hippocampus -- Small Part of Brain with Important Functions. Welcome! If you are visiting this page after reading the November 2002 Mind Matters column in Northwest Prime Time magazine, you already know a little bit about the hippocampus. If you don't have a clue about why anyone would want to talk about a little horseshoe-shaped part of the brain, keep on reading. Among a few other things, the hippocampus is mostly about emotional memory, so that makes it especially important when it comes to depression. The term "burnout" has been popular for many years to describe job, domestic or over-exercise "burnouts" manifested by the classic symptoms of moderate to severe depression. We now know that the term "burnout" is also very relevant for describing the actual neurobiological process that produces moderate to severe depression -- damage to hippocampus nerve cells due to the toxic (burning) effect of certain stress-related neurochemicals. The nerve cells actually get "burned." Below, you will find some links and images that will tell you more about the hippocampus than maybe you ever wanted to know. Some of the links contain significant amounts of scientific language, but they are still fun for those of you who want to know the truth about the brains we live with. If you want to read the original article published in Northwest Prime Time about how exercise protects against depression, please go to It's All About the Hippocampus! To Read More about Depression, Visit Our All About Depression Page. At our All About Depression web page, I have posted a number of articles that I have written about depression. Where is It? What Does it Look Like? The hippocampus is only the two end areas of the dark blue structures. Although there are two structures (one on each side of the brain just inside the temporal lobes), the two structures, together, constitute the hippocampus. 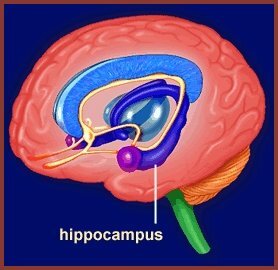 The purple knobs at the end of each hippocampus are the amygdala. The amygdala are related to the regulation of fear. The light blue, curved structure at the top is the cingulate gyrus (important in mood control). Structures are shown somewhat oversized for visual clarity. PowerPoint Presentation - "How Stress Produces Major Depressive Disorder." Dr. Sterling has created a small PowerPoint presentation dated December 12, 2006, which details three of the most important things we currently know about the neurobiology of depression. It includes many pictures that will help you understand more about the location and appearance of the hippocampus and the limbic system (sometimes called "the emotional system"). Moderate to severe depression is not a lack of will power or a sign of a character defect. However, there are ways to help recognize what your vulnerability to severe depression might be and there are ways to help prevent moderate to severe depression. Please click here to view "How Stress Produces Major Depressive Disorder" which is a 659 Kb Adobe Acrobat document. Links to Information About the Neurobiology of Depression. Below are links to news reports, scientific abstracts, articles, and books on the hippocampus and the neurobiology of depression. Some of these articles and reports may contain large amounts of scientific and medical terminology. News Release at PhysOrg, dated November 7, 2006 -- Scientists Use Gene Therapy To Improve Memory And Learning In Animals. From Wikipedia.com, updated December 11, 2006 -- The Limbic System (including hippocampus). From Wikipedia.com, updated November 29, 2006 -- Hippocampus at Wikipedia.com. From Psycheducation.org, posted May 2006 -- Why are some people so affected by stress?. Abstract of article, posted 2005 -- BDNF protects against stress-induced impairments in spatial learning and memory and LTP. WebMD.com article posted August 1, 2003 -- Antidepressants Protect Brain -- Continuing Medication Could Prevent 'Shrinkage' of Key Brain Region in Depressed Patients. From Genome News, article posted July 25, 2003 -- Gene Variant Protects Against Depression. CBSNews.com article posted October 29, 2002 -- Depression Study Eyes Brain Cells. From HDLighthouse.org, posted June 24, 2002 -- Exercise: a behavioral intervention to enhance brain health and plasticity. From HDLighthouse.org, posted March 2002 -- Decreased serum brain-derived neurotrophic factor levels in major depressed patients. Proceedings of the National Academy of Sciences article posted October 23, 2001 -- Depression, antidepressants, and the shrinking hippocampus. American Scientist article posted July 2000 -- Depression and the Birth and Death of Brain Cells. Books? -- There are very few books with updated information. Some of the best books are very expensive. I recommend doing a search using "neurobiology of depression" or "hippocampus and depression" at Amazon.com and choosing the most recent book that is within your price range. Links to More Information About the Hippocampus. The above image of the hippocampus is from the collection of Carol Donner and is displayed at a Web site called Morphonix.com which contains information about a software game called Journey Into the Brain. It is copyright Carol Donner. From years of experiments and surgical procedures, we know that the main location for the transfer of emotional experiences into memory is found in the hippocampus. One of the best Web sites I have found that offers a tour of the parts of the brain currently thought to be associated with emotional responses is Psycheducation.org, created and hosted by Corvallis, Oregon, Psychiatrist, Jim Phelps, M.D. Below are links to Dr. Phelps' Brain Tour pages. Brain Tours - Hippocampus Page. Three Brains in One. Dr. Phelps tells you how our human brain is really three brains in one -- reptilian, old mammalian, and primate. Please feel free to e-mail Dr. Sterling with your comments, questions and suggestions. Have a great day! Copyright 2000-2013. Ron Sterling, M.D. All Rights Reserved.